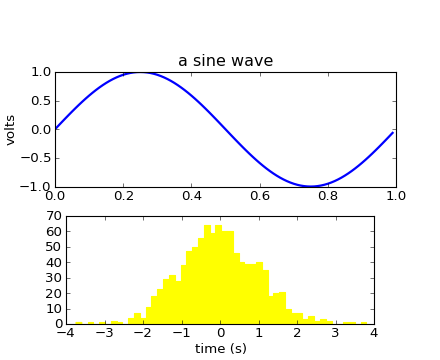 There are three layers to the matplotlib API. The matplotlib.backend_bases.FigureCanvas is the area onto which the figure is drawn, the matplotlib.backend_bases.Renderer is the object which knows how to draw on the FigureCanvas, and the matplotlib.artist.Artist is the object that knows how to use a renderer to paint onto the canvas. The FigureCanvas and Renderer handle all the details of talking to user interface toolkits like wxPython or drawing languages like PostScript®, and the Artist handles all the high level constructs like representing and laying out the figure, text, and lines. The typical user will spend 95% of his time working with the Artists. 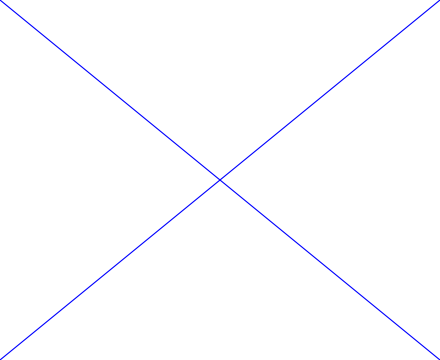 ax.lines.remove(line)  # one or the other, not both! When you call ax.set_xlabel, it passes the information on the Text instance of the XAxis. Each Axes instance contains an XAxis and a YAxis instance, which handle the layout and drawing of the ticks, tick labels and axis labels. Try creating the figure below. The docstrings for all of the classes also contain the Artist properties, so you can consult the interactive “help” or the artists for a listing of properties for a given object. Now that we know how to inspect and set the properties of a given object we want to configure, we need to now how to get at that object. As mentioned in the introduction, there are two kinds of objects: primitives and containers. The primitives are usually the things you want to configure (the font of a Text instance, the width of a Line2D) although the containers also have some properties as well – for example the Axes Artist is a container that contains many of the primitives in your plot, but it also has properties like the xscale to control whether the xaxis is ‘linear’ or ‘log’. In this section we’ll review where the various container objects store the Artists that you want to get at. The figure also has its own text, lines, patches and images, which you can use to add primitives directly. The default coordinate system for the Figure will simply be in pixels (which is not usually what you want) but you can control this by setting the transform property of the Artist you are adding to the figure. 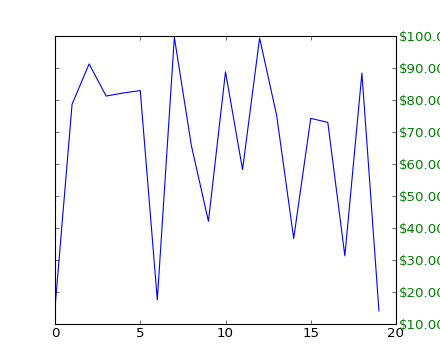 # and the transformation instance is set to the "identity transform"
The matplotlib.axis.Axis instances handle the drawing of the tick lines, the grid lines, the tick labels and the axis label. You can configure the left and right ticks separately for the y-axis, and the upper and lower ticks separately for the x-axis. The Axis also stores the data and view intervals used in auto-scaling, panning and zooming, as well as the Locator and Formatter instances which control where the ticks are placed and how they are represented as strings. 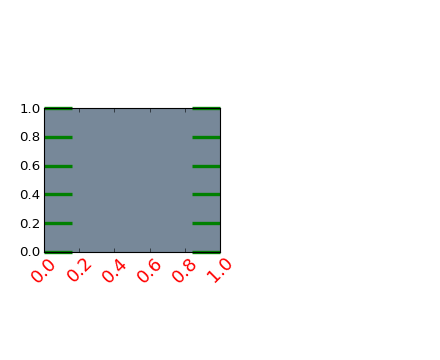 The matplotlib.axis.Tick is the final container object in our descent from the Figure to the Axes to the Axis to the Tick. The Tick contains the tick and grid line instances, as well as the label instances for the upper and lower ticks. Each of these is accessible directly as an attribute of the Tick. In addition, there are boolean variables that determine whether the upper labels and ticks are on for the x-axis and whether the right labels and ticks are on for the y-axis.